Hi, Susan! So glad to have you back! Tell us a little about your new book. This novella is a historical romance, and it’s a sequel to The Christmas Tree Bride, in which Polly had received a Christmas card from her friend Ava. In Blue Moon Bride, Ava rides the railroad to Cheyenne, Wyoming, to visit Polly. On the way, she finds danger and romance. If you were in your heroine’s shoes when the story starts, would you react differently than she? How so? Probably not. Ava’s younger sister is getting married before she does. I never had a younger sister, so I’m not sure how that would feel. I know being single does not have the stigma today that it did back then. But I would definitely see the trip to Wyoming as a grand adventure! How would you label the overall mood of your stories: dark, gritty, poignant, sensitive, heart-warming, light, witty, humorous, adventurous? My son and I just finished writing a seafaring novel, about a nineteenth-century merchant ship manned by women. It was great fun writing the story, and we hope to continue the saga. Right now, publishers are looking at the concept. What do you do for a fun break if you find yourself overwhelmed with writing pressures? Where I live, Jeopardy comes on at 3 p.m. That makes a great break for me—relaxing, enjoyable, and not too long. I also have a piece of exercise equipment near where I watch, so I can work out while watching if I want to. I’m a regular on www.hhhistory.com. The formal name of the blog is Heroes, Heroines, and History. It’s presented by 31 historical fiction writers. Once a month, each of us blogs about the historical topic of her choice. My day of each month is the 23rd. In June, I blogged about the color orange, and what English-speaking people called “orange” before they knew about the fruit by that name. It’s lots of fun, and the topics are widely varied. Come see us and leave a comment. We have several giveaways each month, too, so it’s a great place to win a book by a historical fiction author. In bed, under a cozy quilt, or out on the back deck. In Blue Moon Bride, two young Easterners travel West, Ava to visit her childhood friend and Joe on business. They meet on the train and find themselves allies when they are robbed by an outlaw gang. While Ava emerges unscathed, Joe loses his job in the aftermath of the robbery. Will he land on his feet—and will he ever see Ava again? It only happens once in a blue moon. 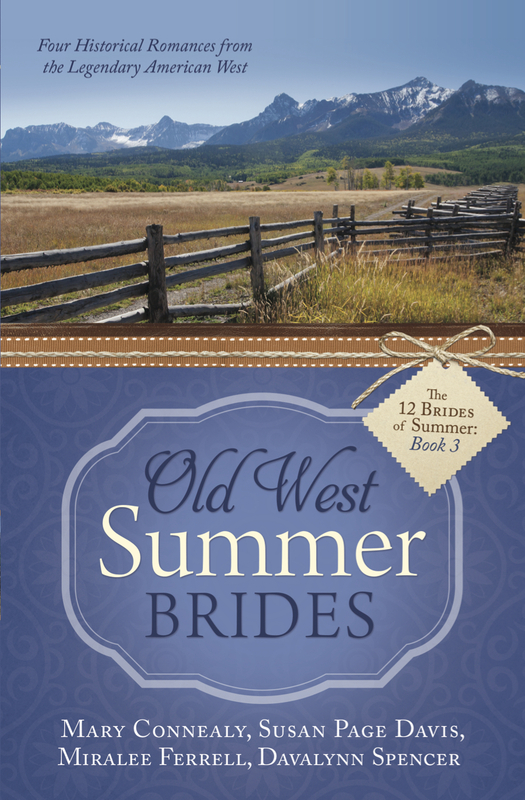 It is also found in the paperback anthology Old West Summer Brides, in Wal-Mart stores. Susan is generously giving away either an e-book copy of Blue Moon Bride, or a paper copy of the collection it’s found in, Old West Summer Brides. Winner’s choice! Comment on the blog WITH YOUR EMAIL ADDRESS (email at server dot com) to win. What about you, readers? Where is YOUR favorite spot to read? Hi, Natalie! 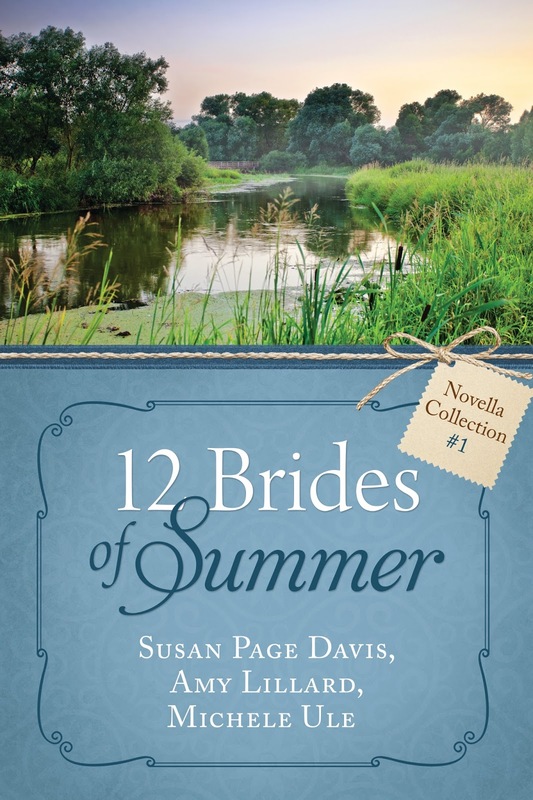 It's hot here in Kentucky, a perfect day to be talking about the 12 Brides of Summer and my novella Blue Moon Bride. Thanks for inviting me! I love reading at the beach, but now that I have little kids I have to keep my eyes on them instead of a book :) These days I read on my bed with as many pillows as I can find! Heidi, I'm with you. Give me a comfy spot inside with the air conditioning. My kids are grown, but I don't read much outdoors now anyway. My daughter and I went walking early this morning to avoid the extreme heat we're getting. It's over 90 degrees now, and I'm in here writing and reading. This whole collection sounds great and Blue Moon Bride sounds fantastic!!!!!!! Mostly I read kicked back in my recliner with a cup of coffee close by. In the winter with a nice fleece blanket over my knees because in S.D. 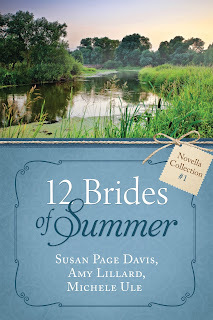 it gets cold and in summer with the a/c on.Love to read new authors and there are a few in this collection. I like to curl up in a comfy chair and a soft blanket! It's fun hearing how all of you enjoy reading, and what your favorite spots are. We all have our favorite comforts, too. I like a cup of tea handy. Hi Susan, My favorite reading spot is the couch, with my dog cuddled beside me, and always that cup of hot tea or glass ice tea to enjoy! Hi, Jackie! I'm with you on the tea, but I'm not a dog person. The cat likes to come curl up in my lap. But you know, my daughter's dog is almost like a teddy bear, and when he comes to visit, I find myself cuddling him too. The couch is a favorite spot for me....either snuggling under a blanket or lying down, relaxing with a good book. My favorite place to read is in bed. I will lay down in the middle of the day with a good book if I am able. I do some of my reading in the middle of the night, if I can't sleep. It usually helps, unless it's a really exciting book. I love to read in my cushy chair by the window with a cup of hot tea. Hi, Merry! That sounds perfect to me. I mostly read in bed before falling asleep. Can't find much time otherwise! My comfy spot is the easy chair with many pillows and my feet propped up. I have my cat in my lap and a cup of tea by my side. What more could I need while reading ?